Cocoduf posted a message on Should Whizbang be reverse Hall of Famed? Why would they. Most of these decks are trash anyway. 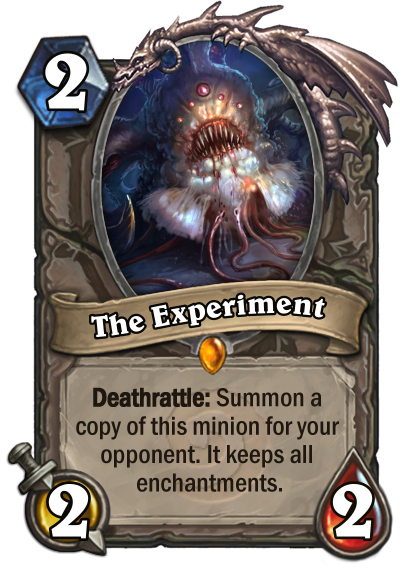 It's better to try creating your own budget deck than playing this card. Some people enjoy the diversity of Whizbang's deck and don't want to play the same crappy deck over and over until they can afford a better one. Cocoduf posted a message on Cards you were hoping to hit HoF - but didn't! As you can see on the Hearthstone technical support forums this is a common issue unfortunately. Blizzard will probably address it soon enough. People don't yet realize how strong RoS expansion is. RoS could be capable to somewhat shake the previous "unshakeable" (mammoth, raven) meta (unlike TBP and RR). Again, stats are fair and often overcosted; but effects (although thematically already seen) and forced swingy synergies are insane. Just add Patches to certain Tempo Rouge builds and it would be good as... or even better then Wild Pirate Warrior (because of tempo cheat). The power level feel is relative, but Token Druid seems as strong as Odd Paladin, in both old and new circumstances. Rng from lackeys and numerous 'discover' effects guarantees swingy and unpredictable turns. That's their plan (everything can succeed or fail at any stage) for the game to balance itself. We'll see how it ends up. Another measure of managing the game from developers' and company's side are forced archetypes. A lot of builds are obvious and autopiloted. Did you ever read what I wrote ? Thanks for your general speak of Meta but there are already so much meta threads in the forum. I've opened this thread for older archetypes like Gonk Druid, Shark Rogue etc. If you have word about them, we all will be pleased but please go discuss these in another meta threads. And try to read whole thread next time. Threads don't consist of the titles. Why some people just answers the title ? Edit: And I have edited the title to prevent next misunderstandings. Who do you think you are ? So much bitterness. You oppened this thread asking if anyone has successfully tried any deck powered by the year of the Raven sets in this meta. Their point is that RoS archetypes are probably way too strong to be ignored (which isn't that much of a reach really), implying that people would have a hard time trying what you asked. No need to act like a brat. I feel you, Resurrect Priest is my favorite deck of the expansion so far. I just played a game where my Catrina Muerte got to stick around for more than 5 turns and the only minion in my res pool was Convincing Infiltrator. Glorious. Recursive effects caused by Lord Godfrey and such can only trigger a finite amount of time to prevent infinite looping. I've been playing Control for several months but with the expansion I decided to switch for aggro, and it does feel very good to be the one setting the pace for once. Cocoduf posted a message on META TIER LIST IS OUT!!!! Cocoduf posted a message on RoS legendary quests bug?